Enjoying his retirement in the lush hills of Virginia’s Shenandoah Valley, Don blends his free time with taking care of his beautiful home, traveling with his wife of 34 years, Shirley, and working in his exquisite studio creating digital art of the highest quality. He is a long-time Mac user and uses Vue, Modo, and Zbrush, along with several other software packages as the primary tools of his handiwork. 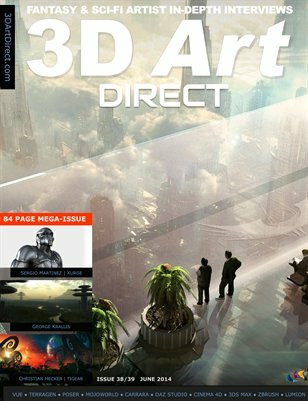 We originally interviewed Don in issue 19 of 3D Art Direct, and we’ll return to visit his work in this month issue. 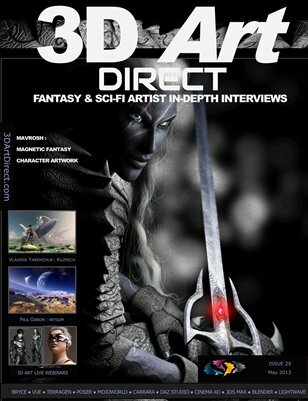 3DA: We are honored to be joined by the very talented Don Webster, a 3D artist of extraordinary skill. 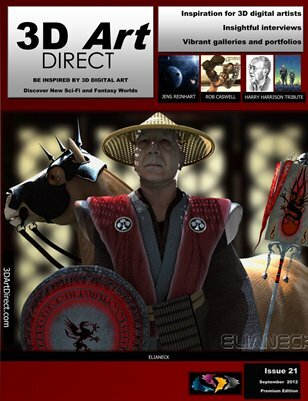 His diverse gallery of images shows savvy techniques across a wide variety of 3D applications. 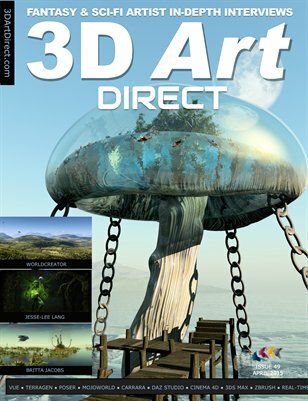 Welcome to 3D Art Magazine. DW: Thank you for having me participate. 3DA: Before we jump into the art let’s get to know the artist. You’ve been working with images of some sort for most of your career. According to your bio you were an aerial surveillance officer in the 60s. Tell us what that was like and how it prepared you for future art works. DW: As a young Intelligence Officer stationed in Frankfurt West Germany, I ran an imagery interpretation group whose mission was to keep a watchful eye on the movements of East German forces through the use of aerial photography. This involved looking at very large dual image film strips using a device to view these in stereo. The ability to view things in 3D greatly aids in figuring out what is going on, on the ground. Each frame was about 10 by 20 inches and viewed on large light tables with reels at both ends. Using film positives was the typical surveillance activity for a group at a Corp Headquarters supporting the G2 Intelligence Officer who reported to the Commanding General of, in my case, V Corp, 7th Army Europe. This was also the days of U2 flights controlled directly out of Washington, and something new in our area: SLAR, Side Looking Airborne Radar. A long torpedo shaped device attached to the side of, in our usage, Mohawk aircraft that would fly alongside an area of interest while the radar beamed out for miles watching movements. Now you have to understand that I was a young married officer stationed at a level that makes this more of a Pentagon type day job with free weekends and time to travel the roads of Europe in my 69 XKE. (Oh, to have her back now.) The G2 is an intelligence section watching not only what was going on but signs of new technology. Back home we were putting men on the moon using scientists that came from Germany, that place where strange new weapons had been developed, so with a world of history, castles and Formula One racing at every turn it was a natural response that I would buy my first real camera and then include film processing. After several years in Europe, I returned to the states to be discharged and ready to start a new career in the visual world with my wife and first son. Those years gave me a chance to see things I had been looking at in books at the library as a teenager and only dreamed about. A texture of life, art, and an appreciation for life that came after years of war for the people I met there. 3DA: You also state you spent sometime in the 70s, “Conceptualizing technologies.” Considering the times, pre-PC and post energy crisis, it sounds like an exciting project for a budding computer artist. What were some of your technology concepts hits and misses? Has most of your tech predictions come true? DW: I joined a graphics company in Washington DC and brought with me my photographic equipment, 35mm, 120 and 4×5 view cameras, studio lighting and lab processing hardware. I liked having full control from start to finish and I wasn’t really interested in normal commercial photography assignments you would get in the city. 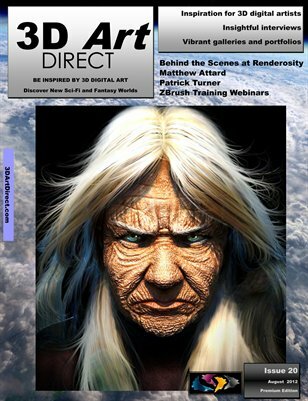 I was more interested in using my systems and processing to speed up what graphic artists in the studio needed. This was a time when we were all watching Star Wars and the compositing and motion cam work being developed. Using film in the lab to create production capabilities for graphics seemed so high tech at the time. That was until the day I saw my first multi projector slide show. There were 15- 35mm projectors controlled by a device that ran a power panel for each group of three. With multiple projectors providing an orchestration of light and sound all displayed on a very wide screen, engrained my current love for extreme horizontals. All was not lost. When the manufacturer of the system, AVL, introduced a new control system, I was able to plead my case and they allowed me trade up at no cost. Ultimately I joined a project management firm to develop presentation materials for DARPA. It was an office of all ex-military officers and I felt right at home. They provided me unlimited access to whatever I needed to begin upgrading their antiquated graphics systems. What started out as a one-man operation turned into a department of two dozen. With a history of technological successes management pushed me to take a more active role in defining emerging technology. I brought DEC Vax, Wang, Osbourne portables and a wide range of hardware/software solutions into the mix. For my efforts they made me a VP. Before long I was introduced to the MAC world with the advent of the Apple II and III. Along came LISA, a very advanced, but pricey system of interactive applications – LisaDraw, LisaWord, LisaCalc, LisaProject, each with a graphical interface, controlled by a mouse. It was like magic and I’ve been an Apple devotee ever since. 3DA: Talk about your later video and television production work. How did you make the transition from that to software development? DW: I joined Arthur Young, one of the big eight accounting firms at the time, to modernize their art department. Within weeks I was asked to manage their Video and TV production facility. With professional grade 1” Sony deck editing suites, a huge sound stage, fabrication department and a staff of about two dozen, my years of working with people under tight deadlines began to pay off. In addition to normal corporate production the studio also created local TV programs and public service work for the US Olympics, American Red Cross, Peace Corp, and others. Cliff Roberson, Bill Murray, and the late Sergeant Shriver, were some of the well-known people to use the studio. Sometime later at a company picnic, a software developer I had met and encouraged years ago told me he needed help expanding and organizing his small company. I was enticed with the idea of creating a 3D application he was developing only for the Mac – MiniCAD. Growing a staff of 7 to 80 over 12 years was very rewarding. I still miss my young technical staff of engineers and artists. 3DA: In looking at your gallery it’s easy to see you have a deep interest is all things historical. From the Roman Empire, to the American Civil War, to warships and combat aircraft of various periods, your collection is a diverse peek into the past. How did this fascination with the past come about? DW: I’m an only child whose parents both worked in management. I often had a sitter, or nanny, but was left to my own building amusement devices. Usually most often with plastic bricks as I remember which I think instilled an understanding of 3D space. I took rolls of shelving paper to draw on, usually houses or castles that I would someday live in. My father passed away when I was 13 and we moved to the Washington area where my mother worked for the Federal Government. She believed in being self-reliant, so in my early teens I was allowed to take the bus into Washington where I would go to the museums. Being a bit older in my mannerisms, mother always pushed responsibility and the parents of my friends allowed me to take them along. I would point out things almost as a tour guide. It was these years of seeing history through the halls of those DC museums and my love of cinema developed my historical slant. 3DA: Here’s your opportunity to brag. Your website is webstersandsonsstudio.com. Your oldest son, Dane Webster, teaches at the Virginia Tech School of Visual Arts. Tell us about how you have been an influence in the art development of your son. The “and sons” part of your website leads me to believe there are more Websters. Care to elaborate? DW: I have four children by my first wife of ten years. When we separated and she moved to Utah, my youngest was two. My wife now of 34 years is a professional woman who discovered because my children were so young it was like having children of her own. They would come each summer for a month and Shirley loved making plans for the month’s adventure. Fortunately we both had positions where we could take off for 30 day. We would rent an RV and head to Florida, go to Cape Canaveral, Disney World, St Augustine, before heading back to Williamsburg. Shirley loved arranging everything, the food, the packing, all of it. All I had to do is drive. We have two boys and two girls – Dane, David, Azure, and Ryn. I named the studio as Sons, because in the long run, while Dane is an artist/teacher, David is the business man side of me and may in the end handle what I have amassed in imagery. He’s a father of four, lives in Denver and is an area director with an insurance firm. Azure, a diabetic since she was 7, is a health nut, financially independent, and travels the world with her husband doing marathon bike events, nature traveling, and climbing the nearest mountain. Ryn is a mother of a beautiful little girl. Her husband is a Swat team officer in Utah and enjoys being out in nature and like her older sister is a health nut. At 40, Dane is now the teacher of me in many ways. His natural logic and ability to solve problems draws him into more admin/management situation at Tech then is good for his teaching role. He could very easily move into a more director role at Tech and has been managing the Graduate program for some time. He is on sabbatical right now teaching himself programing as he works on an animation of a data program that visualizes the spread of viruses thru populated areas. 3DA: You have a magnificent studio surrounded by artwork, various knick-knacks and memorabilia. How important is it for you to have comfortable workspace? DW: Much lot of my office is a collection of items from places I worked in my career. At the time I wanted to create an air of interest for visitors to sit down where we could work out problems. It provided a sense of who I was a comfortable environment for any one coming to my office. Today, these are memories. I’ll be 65 in September and find I have forgotten a lot of the things I have done, experienced, and it helps remind me. This is my world – my desk from 20 years ago, the spears and head axe my father brought back from Asia in WWII. In a case behind me is a Beaulieu R16mm film camera which in the early 70’s I use to dream about, today I have one which is a reminder of those interests, yet is now an antique of beautiful design. 3DA: Tell us about the technical aspects of your studio. Describe your workstation and how you are setup to work. DW: My workstation is a MacPro, 4 core with 11 gigs memory, 4 internal drives and a MacMini running a 23″ monitor. The heavy work is on the MacPro and 30″monitor. The other is for research, email, prep while the other works away. I use a Wacom tablet, a 4T netdrive and print out to an Epson 4000pro. I use to have both Mac and Windows but I just couldn’t take Windows anymore. It remains to be seen where MacPro goes in the future, but I am hoping for a new 12-core machine someday soon. 3DA: Let’s shift gears a minute and take a peek into your toolbox. You list a wide array of applications you work with. For each application tell us your likes and dislikes and describe briefly how you apply that package. We’ll start with Modo. DW: Modo is my main modeling tool, a very clean and logically designed application with many features that I have yet to touch. Dane got me into Modo early on. A real benefit for me is I can get him to create me little tutorials on how to do something. For me it is not only the clean approach to modeling in the program, but the entire Luxology approach to support, information, and upgrading. These are all very important to me where a simple can be aggravating. Now Modo is not perfect, but you see an effort to constant improvement by people who have been in the industry for some time and are users themselves. In particular, I need to get more involved with rendering within Modo. It is very fast and has wonderful rendering quality. I UV most of my models but this is an area that I could and should expand my skills in. Baking, normal maps, recoil, the interaction of objects and their physical reaction to each other, articulating objects, are all areas that I look as new challenges for me in the future. sculpting is all I need at the moment and has been keeping me from pushing more into ZBrush. DW: My use of Blender has been in the area of soft-bodies. Draping material was and is easy to accomplish in this app and you can’t beat the price. I think as an ex software developer, I naturally lean toward supporting traditional development houses, but providing an application of this strength to an open market which allows anyone with the desire to be creative is to be praised. DW: I greatly admire the work that is being developed by this application. I often find work that truly touches my soul in the fine arts area of sculpting. I have used this program for many years and waited through the extended development time to bring back a Mac version. I even wrote their COO as one COO to another to discuss what was going on after the first deadline was missed by a year. I have used it for particular needs such as my BenHur statue at the end of the chariot race center island, not perfect, but acceptable I hope. I guess my problem is my age. Dane agrees with me also, that to master ZBrush, one really needs for it to be their main if not only application to keep up with the tools and GUI, and in my case, it will never be my main toolset. As it stands now, when I need to do a particular thing, I will study up on the how-to’s, accomplish the task and move on, knowing I will not remember how I did it a week from now. DW: I have a love hate relationship with Poser. I like doing epic scenes and Poser isn’t really suited for it in my opinion. Rather I think that Poser is a great program in the area of stage sets where the posing of figures is naturally the main focus. I don’t think I’m really telling anybody something new here. My use is normally setting up figures which I then export as obj into Vue, or to Modo if I want to rework the figure or some element of associated items, clothing props etc. Currently, and again as a challenge, I am converting some of my models into Poser runtimes. Nothing hard really – no conforming clothing, morphs, etc, just simple props. This activity got me into their node system and lighting controls. While a new experience that I will become more familiar with…I have to take my hat off to all those asset developers out there that create really beautiful items for the DAZ figure sets. I plan to take some time this winter to go in and rename all the library items so that I can evenly find things or at least have some idea where they are. DW: Vue is my electronic canvas where I create my dioramas as I call them to the unknowing. I do not use it for its main strengths, landscape, eco plant system, but for its ability to provide me a space with natural atmospherics, lighting, and materials such as glass, water, vapor. I often create scenes like the Yorktown Hanger scene to show people that Vue is a great product where there’s not a single plant in the entire scene. Vue has a large number of capabilities I have yet to touch or may never get to. I think of all the applications I use, and not all listed here, Vue is my central app that everything else feeds. It is in many ways my movie set with Poser bringing in the people, Modo bringing in the sets and props, ZBrush in the makeup room with detail touch ups, and Blender wardrobe. 3DA: Are you using Photoshop mostly for postwork? DW: After a render, I do a lot of relighting in Vue, then the tiff file is move into Photoshop CS5.5 where I adjust light and shadow, contrasts, adjust selected colors and then will look at color filters in some cases. I do this in layers and then start creating overlays where I will paint in additional details. When I’m doing a canvas print, normally 14-16×40″, the render is at 300dpi. Depending on the size I sometimes have to render out in panels and reassemble in CS. I also use Perfect Resize 7 to resample a 150dpi full picture render to 300. 3DA: How do you begin to develop an image? Are you an obsessive planner with a clear vision of where you are going or does the image take a life of its own as you bring it to life? DW: Something will trigger an idea like the trailers from Prometheus before it came out. These scenes triggered memories from past epics from Blade Runner, 2001: A Space Odyssey, etc., and what it is I liked about them. I don’t do Sci-Fi so it was a challenge in this case, but on my terms – no shiny ships, cargo shapes, or aircraft inspired winged fighters. It was all a bit organic, dirty and used and with probes almost feeler like. Having created the model in Modo, I then move over to Vue where I set up my initial vision, but have no problem being surprised and moving off center from the original idea should i see something that catches my eye by mistake. Once I have a basic scene developed, I start looking at it from different camera angles, sometimes setting up a dozen cameras, different focal lengths etc. I also use a lot of lights which I really enjoy in Vue with their relighting. I often mention that people should use these more than just tweaking a scene. I never turn my systems off and will set up a render and come back hours later to save and try something else. It is this collective of renders that I then view together to get a feel of where I can take it. This next session will focus down onto a tighter scene and usually requires me to go back and rework the model and or create additional elements as I did in this case creating the massive landing gear. Dane tells me that I’m an ok artist but my main strength is composition. Maybe he’s right. I do tend to look at images and pull them apart. In the galleries we all post to and comment on the works of others, I often find that I want to suggest moving this here or enlarging that and stop before I offend the artist. We all say we want helpful critiques, but it’s not always the case. 3DA: Your image Brugge – The Studio is a masterpiece worthy of hanging in any art collector’s gallery. The tiniest details really stand out and the balance between light and shadow is immaculate. The work has garnered much deserved fan praise. Tell us about how this piece came about and how you put it together. DW: Well thanks for the kind words. The studio was the final effort having created several versions of such a room. Like the Day on a Canal was a build process of creating and placing objects into the scene and making slight adjustments to placement. Think if you were setting up the room for a camera shot, you would be moving things around, turning, leaning and rotating to create a pleasing set up for the camera. Not much difference here, just keep working the scene. Any good artist, photographer, writer is going to work the scene to achieve just the desired effect. What I often see is people get excited about this new image in front of them and they can’t wait to finish and show someone. It should be a rule that you have to leave a work you think you have finished for a day or two before returning. I think it allows you to see the real image before you. This particular work was created several years ago. I wanted to do something large for an art show in and around Winchester Va. I think it was the last show I did with them as the majority had no idea how my work is done. I even took my IPad where I could show an animation of what 3D is by seeing one of my models pan by. Most believed that I was just using pieces of photographs to create. Did you ever try to explain to a well to do older lady wire frame modeling? The younger people totally got it but find the subject matter uninteresting like old museum stuff. 3DA: The bulk of your work is the historical stuff but you have stretched out into Sci-Fi and fantasy with the same skillful touch. Some of your latest work includes inspiration from the new Ridley Scott film, Prometheus. Specifically, The Chamber: Portrait, is a fantastic image, not only for its technical aspects, but for the use of color and reflection. Tell us about this one and how you approached the design? DW: Actually it was a failure in that I really wanted almost a straight on shot into the face mask with her cheeks being lit by internal lights in the helmet, but they just caused too much interference with the reflections on the plastic face plate. Turning her to a side profile, I was able to light her face and still play off the reflections, which by the way is not from the scene, but a reflection map from the main chamber render. The suit was a purchased asset brought into Modo and captured the poly structure from the model, removing it to a separate mesh which I could then use the glass materials advantage in Vue compared to Poser. At some point I will try again and add what I think is missing – an energy and fear to her expressions. 3DA: One of your more striking WWII images is, Preparing and Refueling for Battle: Midway. There is so much going on here with the hangar deck full of planes and mechanics going about their jobs. It’s all very busy and you’ve done an excellent job of capturing the activity in a static image. You list this image as one of your largest projects with over 260 hours of render time involved. How did this evolve? DW: A lot of my modeling work is stick building, architectural in nature and not organic like a car or ship. I had just finished creating a Viking hull and feeling fortified from this moved on to creating the America’s Cup Shamrock III sailing ship from the 30’s. The hull I thought was going to be the challenge but turned out to be quite easy. With this all under my belt and feeling like nothing is impossible, I put on my epic scene hat on and decided to research and model the USS Yorktown CV5, sunk at the Battle of Midway. I felt that it would be interesting to create some dramatic scene looking out the sides from the interior using the elevator openings. These are very large areas with a lot going on especially during Midway. I had purchased planes which I could use and imported them into Modo where I cut the wings off, removed the cowling, opened panels into the wings and created mechanics to be worked on. With a cowling removed it was going to be necessary to create a rotary engine, which would need a service stand, tool assembly takes, welding equipment, all needing to be created. Evolving over several weeks, I really got into creating a composition of action with planes flying by, a destroyer alongside, and I have to say that Vue seemed quite happy to stay up with my constant loading of polygons. Certain areas started to become mini compositions in themselves and I started controlling these as such with their grouped lighting, personal, equipment, and such. With over 69 lights, thousands of objects and I don’t remember how many ploys, this was a huge render, but then again I’m rendering out at 300 dpi and 40 wide. While I’m mentioning render times, I am often disappointed to hear people complain about render times of a few hours. They should consider what they create is forever. Take the time to create and if something takes a few weeks to compose and then days to render, it’s the final image that you will be faced with and the time it took to make is forgotten. I mentioned my dad had passed away when I was young. He was in the Philippines during the war, had lived with the pigmies as a connection with US forces fighting the enemy. He saved a child from drowning who turned out to be the chief’s son. Now an honored quest, he was given a crossbones ear ring to wear for safe passage. I even have a wonderful knife they made him. All exciting stuff to tell the grandkids along with the spears and such I now have. At the time, I’m sure as 2nd generation English decent, he loved it too, but there was a price in malaria, and that coupled with a four- pack a day Lucky Strike habit, which was heavily promoted by the military at the time, did him in at 47. To make note of this, I modeled and placed on the stairs to the lower left an upside down pack of Lucky’s. 3DA: You are one of those artists who made the transition to modeler. 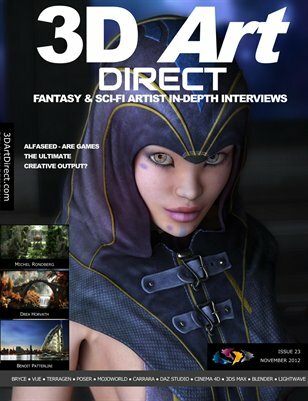 Tell about your decision to start modeling and what advice you would give someone considering a jump to that part of 3D art? DW: It’s an interesting point you bring up, artists and modelers as two different groups in most cases. Modeling is so technical and constantly moving forward with new technologies that I think that it is all that a good modeler can do to stay current, and competitive in the marketplace, and that’s the point. They model to produce products to sell. Now I as an artist, be it for myself, or in commercial work, I look to modeling as just one of my tools in creation, no different than paint, brushes, and something to put them on. It provides me control over what I want to do and is an extension of my creative needs. This can be in the form of using purchased assets, a mix of bought and self-made, or total control in doing everything. The deciding factor is time, how much time does one have to accomplish the desired image. As mentioned above, I use a number of programs, none of which I am the master of, all of which I use for particular needs, just like selecting a particular brush. Technology allows a single person, hobbyist to freelance artist, the ability to create in total an end product, be it print, or asset. These single activities benefit from a broad market of assets that are available to all at reasonable prices considering how long it takes to create something worthwhile. Now when we start looking at industry, game, movies, advertising, the complexity of what is going on in special effects is so demanding that modeling is broken up into sections; texturing, rigging, etc. and is just one element of the total production picture. I think by the time an individual gets through a good fine art school, they will have learned they will not be creating the entire anything out there in the workforce. They are going to be part if a team, individually, a small part of a much bigger picture and that becomes the satisfaction, part of the effort for something special. Dane once pointed out that people need to appreciate movies like Pixar’s UP, but also pay attention to the running list of people it took to create it. A calculation was made that if a single person had made UP, it would have taken 47 years. If someone is looking to make this a career, research out available schools. Go visit them and talk to students if you can. Professionally, you are going to want to focus on just what areas of the industry of most interest. Better that you see some working examples in the form of working professionals, then just assuming from the pages of a magazine. 3DA: When looking at your collection of models it’s very apparent you have a strong artist’s eye for architecture. It doesn’t seem to matter whether it’s ancient Rome or Renaissance Europe the buildings and infrastructure is spot on. Would you relate this to a strong research ethic? DW: Well, I guess I have fooled people. I would like to think that I do a lot of research, but considering how some of my friends model military weapons, ships, armor, etc., I’m a failure at it. This may sound a bit strange, but remember I said that I create models for my own canvas work and then provide them to those interested in the same subject matter. Because I am creating them for a composition, I am in many ways painting with models, creating items that provide an impression of what our mind thinks is true, and historically correct. You might liken this to the modeling department at ILM where the creation of craft for the Star Wars movies were physically made out of what was called, kit bashing. It was taking lots of plastic models of just about anything that looked interesting and then using the pieces for create the whole of something. If you were to look very close at those massive Star Wars ship models you might find a car bumper. The point is as a whole they were very impressive and fed our minds that already had a preconceived image of what something like that would look like. Now this is not to say that I do not pull hundreds of pictures of what I’m about to model, and depending on the type of object, I will stay closer to the real thing. My Yorktown Carrier is a good example of pulling the original shipyard plans and laying them out on a 30″ monitor to work from. But are all the pipes in the exact location, no. I’m not making a model that is going to sell for 400-900 dollars. There are those who do and their work is tremendous. 3DA: Along that same theme talk about the relationship between art and architecture as you see it. In the 3D world there is a certain amount of engineering and architecture involved with the software so it seems to be a natural translation. DW: Living in a three-dimensional world, it seems natural to me that from the moment man was in control of the materials around him that he would build structures to both praise his own accomplishments and power as well as honor those forces he did not understand. I think that we need to look back at how architecture was used as a three- dimensional canvas much like painting on panels was. I may be wrong to think that painting was actually a decorative art in the Middle Ages, and not as important as the art of building fine castle, palaces, and cathedrals. Today we look at architecture as a functional structure and while we can get really creative in designing modern structures, it always comes down to function. 3DA: What are you working on these days besides enjoying retirement? DW: Learning. I take on tasks that will cause me to learn something new. While I enjoy the last project completed, in the long run I want to inject more motion and emotion into my work. Static in nature, I want to achieve a sense of movement within my work that I have so far failed to do. Da Vinci’s Battle of Anghiari, Ruben’s version, full of energy, a personal challenge to achieve something in this manner using Poser and Vue. I will probably have to wait for that dream 12-core machine. Commercially, the online gaming development fits well into my yearly schedule. In beta right now, Socius Bellum, is the first of what will hopefully be a number of interesting gaming projects. 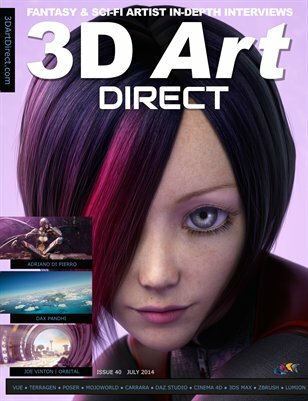 3DA: To wrap things up what three tips would you give to newcomers in the 3D art world? DW: 1. 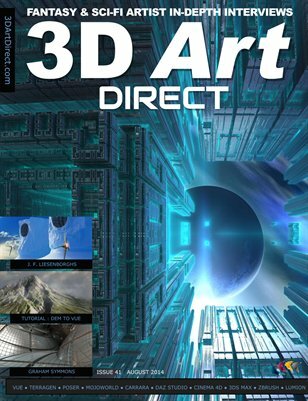 Be knowledgeable: While we are talking a creative process, of emotion, and style, 3D is also a technology that requires a constant effort to learn, keep up and investigate the new. 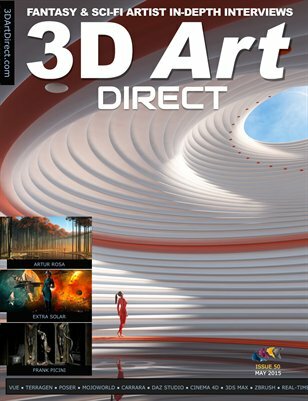 While fine art artists depend on solid working skills and a unique personal talent and style, the 3D artist unlike anyone else is faced with a broad technology encompassing complex applications, hardware, and computer skills. Applying yourself with this knowledge will allow you to constantly grow into visions you could only image doing just yesterday. 2. Be focused: I don’t know if I should actually bring this up, but this is not a 9 to 5 job. Like all artisans, the creative process is always there, always just a few more hours, days, from completion. Just give me a few hours and I will be done. If you are a single person, well you already are on your own timeline; if you are married with children, you need to structure your time, to have a family. They deserve you too. 3. Be driven – be your own worst critic. That doesn’t sound like fun. Being a single artists/freelancer is a disadvantage in that you only have what you see online or local friends to set your standards. Friends, like what you see in the gallery pages online, are going to tell you how great your work is, even when not true. In the commercial world you have fellow artists who are going to push you and also be competitive, all good things to increase your skills. Yes the studio artist also needs to be driven, but the artist must constantly push themselves to compete and improve. Finally, I think that the technology allows us to be overly impressed with our efforts at the end of a session, don’t be easily satisfied – push on.